Strikes are rapidly spreading beyond of the maquiladoras in Matamoros, Tamaulipas as workers are demanding better pay and working conditions. Workers at more than 27 non-maquiladora businesses walked off the job yesterday alone. As noted previously, this strike action represents the real threat to the bourgeoisie who fear it will spread not only to other border state maquiladoras but across the country.Over the last several weeks workers at 48 maquiladoras in Matamoros, many making as little $1 US and hour, had walked off the job demanding a 20% wage increase and a 30,000-peso bonus. A paltry demand for impoverished workers virtually enslaved in oppressive working conditions with the lowest wages in the Western World. With this new spread of strike action yesterday, workers are referring to their growing “movement” as Movimiento 20/30 to reflect the previous demands of the maquiladora workers.But behind the immediate demand for higher wages is a growing protest directed against the union taskmasters who work at the behest of the boss. mcclatchydc.com At Blanquita, a water purification company, 170 workers walked off the job as they denounced not only exploitation of their employer but the indifference of the union to their cause as well. At least 70,000 workers from 45 factories—including tens of thousands of auto parts and assembly workers at companies that supply GM, Ford and Fiat-Chrysler—have launched a wildcat strike in the US-Mexico border town of Matamoros. The strike is a rebellion against both the “maquiladora” manufacturing corporations and the pro-company trade unions. Over 1 million workers endure low wages and sweatshop conditions at the 3,000 “maquiladora” factories that line the Mexican side of the border and account for 65 percent of Mexican exports. It looks like it has the potential to escalate. China has detained student organisers and factory workers in at least three cities as a crackdown against labour protests spreads across the country. Security forces stormed student and worker dormitories in Beijing, Shanghai and Shenzhen on Friday night, according to student activists, taking away five university students, three workers in Guangdong province, as well as several employees at a Shenzhen-based labour rights organisation. It has now spread to other cities. “Greece’s notaries have begun a two-month strike aimed at blocking the leftwing Syriza government’s plan to launch electronic auctions of repossessed properties this month, as agreed in the country’s current bailout deal with the EU. The notaries resorted to industrial action after their requests for protection from attacks by leftwing extremists protesting against foreclosures were ignored by the authorities, according to Giorgos Roskas, president of their union. Since austerity became official in 2010 food banks have grown exponentially. With an estimated 2,000 distribution centres across the country and tens of thousands of volunteers, they are now a key part of the state’s welfare ‘safety net’. 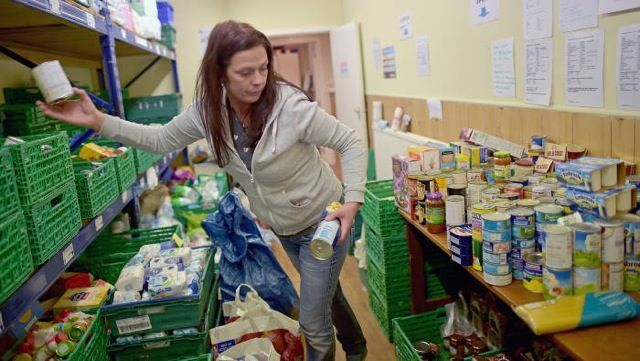 To use a food bank, a referral is needed, typically from social service or housing support officers, but also from agencies such as local charities or Citizens Advice. The number of people resorting to food banks mushroomed after Benefit sanctions were introduced in 2012. (These can be applied at a bureaucrat’s discretion in cases such as failure to attend jobcentre appointments, interviews or health checks. Benefits are cut for periods from four weeks to three years.) Research by Oxford university found that for every 10 extra benefit sanctions imposed between one three-month period and the next, five more food parcels were handed out. Now the Trussell Trust, which covers two-thirds of distribution areas, reports a 6.64 per cent average rise in referrals for emergency food in 2016/17, but a 16.85 per cent increase in universal credit rollout areas. The movement began on Saturday night (August 120 with a partial strike for a few hours, but in the face of the company's inflexibility and the provocations of security guards (who asked workers to denounce the "agitators") the strike was extended to thirty establishments in this industrial hub. According to the Egyptian independent press the strike is 100% solid. The workers are demanding those annual bonuses, and profit-sharing payments which often end up disappearing from pay slips. In this case, the strike started over a bonus payment that was due in July. After waiting for a month, the strike started, with a much wider list of demands, which add up to a 10% increase in wages. The company, the Misr Spinning and Weaving Company, has repeatedly attempted to negotiate with the workers but only through the state-owned union, which does not play any role in the strike and often takes the side of the state and the bosses. Tata Steel paid its top European managers loyalty bonuses totalling about £25m after its UK workers accepted a pension cut to keep the British business alive. The “retention” payments were made to high-ranking staff across Tata’s UK and Dutch operations, according to people briefed on the matter. The move is likely to rankle the workforce of Britain’s largest steelmaker, who voted to approve the closure of a £15bn retirement scheme earlier this year in a bid to save the Port Talbot steelworks in south Wales. Since Wednesday 24 May 175,000 construction workers in Quebec province have been on an all-out “general” strike. This is a repeat of the same strike in 2013 which was halted through a "loi spéciale" passed by the Quebec National Assembly ordering the strikers back to work. This is expected to be repeated today on the grounds that the strike is costing $45 million a day. The province of Québec is the only province in Canada where construction workers are obliged to belong to a union. A lot of these workers are small registered contractors in their spare time which give them the advantages of tax deductions while still being employees with salaries over $80,000. The construction sector is the most unionized sector in Québec province. About five years ago, the unions got the authority to manage the deployment of workers to sites (it was called the “placement syndical”) so they played immediately some kind of a management role like a boss. If union bosses didn't like you, you would have tough times finding job as a construction workers. However this role has now passed to the Québec Construction Commission. Construction workers have a reputation for being combative and defiant . They are impressive in their numbers and actions but they don't have the same class consciousness as other industrial workers who see themselves as nothing more than … workers. We want to bring your attention to the fact that the catering company at Rackspace, The Genuine Dining Co. recently sacked a worker (Boubacar-Claude) in their kitchen after his brother passed away. They would not authorise the time off he needed to cope with the bereavement. Boubacar was very close to his brother and took the news hard. He provided doctors notes saying he was unfit for work. He was looking for understanding from his employers. Instead he was sacked. Boubacar appealed the dismissal and still the Genuine Dining Co. were Genuinely Unsympathetic. Boubacar has worked at Rackspace for one year and is liked and respected by his colleagues. We hope you will support him! We are asking you to raise this issue with your managers and boycott the canteen until Boubacar receives his full wages for the time he was off sick from work. In February, a strike of workers metrostroiteley Construction Management "INGEOKOM". "INGEOKOM" paid one-tenth of the amount promised by the workers - and the strike resumed in March. March also ended only in partial payments. Moreover, on March 30, many workers were dismissed in connection with the expiry of the term of the employment contract. And, of course, without any payments. Collective visits to the President's Reception Office and to the Investigative Committee also did not yield any results on the workers' stolen wages. In order to quickly finish the story with the recalcitrant workers who do not want to work for free, the leadership of the SMU "INGEOKOM" has begun to take even more decisive measures. On April 18, about 30% of the debt was paid to workers (not all), after which the workers were announced about an upcoming eviction from the hostel. The management of INGEOKOM, wants to steal with impunity and leave workers without housing. On Monday March 27, protests took place against the "Plato" system in different parts of Russia. The drivers of the trucks stopped the delivery of consumer goods and parked them in parallel along the roads (partially blocking them) whilst the drivers attended rallies. Truck drivers from more than fifty regions of Russia are taking part in this all-Russian strike. The action is also supported by truckers of the Republic of Belarus, who are also ready to stop transportation across Russia during the strike. "Plato" is the Russian system of taxing trucks which exceed the maximum permissible weight of 12 tons. From the moment the system was put into operation on November 15, 2015 money has been collected from haulage firms via bills for compensation for damage caused to the federal highways. Protesting drivers of truckers are united in the organisation "Association of Carriers of Russia" (OPR). The "Association of Carriers of Russia" arose in the course of the struggle for the rights of haulage contractors, which began after the introduction of the "Plato" system on November 15, 2015. This protest is not proletarian, but largely petty-bourgeois, as the truckers mainly own their trucks; although there are hired workers among them. Metro builders once again went on strike because of non-payment of salaries by SMU "Ingeokom"
In Moscow, metro builders on Tuesday once again went on strike because of non-payment of wages of SMU "Ingeokom", said on the air of the radio station Ekho Moskvy (Echo of Moscow) activist Alexander Zimbovsky. "More than 100 people are on strike, they refused to work because of a small salary. The Labor Code allows it - in case of non-payment of wages for more than two weeks, workers can suspend work, but this is not a few weeks, but several months already, "the activist said. He recalled that the workers of the SME "Ingeokom" had already carried out a strike because of non-payment of wages in February 2017, then the company's management promised to pay off the salary arrears, but to date has paid only part of the amount. The leadership of the SMU "Ingeokom" has not yet responded to the strike, added A. Zimbovsky. "At the moment the management does not say anything. This is not the first strike on this site on this topic, the first was on 20 February. Then it was promised by the leadership of the SMU "Ingeokom" in the presence of the prosecutor's office and the Investigative Committee to immediately pay off debts on wages, debts were repaid only partially, "the activist stressed. After all the manoeuvres of Tsipras and his supposedly anti-austerity left party pensions which have already been cut are to be cut by another 15-30% to meet the terms of the Third Memorandum with the Troika of the EU, IMF and ECB. All this to obtain money that will only go straight back to Greek creditors and will do nothing to fix the Greek economy. No wonder the pensioners took to the streets in protest but perhaps no surprise that the police, in defence of the Syriza regime, should attack them with cudgels. And these guys were arrested the day before the Paris bombing. Teresa May says new anti-Terrorist measures will be used against "activists" (unspecified) and the French police have already used the state of emergency to block climate change protests and "preentively" arrest over 200 environmentalist activists. Nov 25. Workers in Rome’s regional bus company have now been on wildcat strike for 3 days. The reason. They have not been paid in 2 months. The strike has caused massive disruption for thousands who use the service to get in and out of the city. It seems that the Roma Tpl bus company which operates 30% of Rome’s buses is refusing to pay the workers because the Rome Town Council has corruptly (it is alleged) held back subsidies to the firm. The firm though is still paying dividends to shareholders and the wages of managers. The workers also realised that the firm would still get its subsidy if any buses operated on the line so they took to mass picketing to prevent any buses leaving the depots. The Rome City Council is now saying it will pay up but as the money won’t reach workers immediately the strike goes on. Yesterday morning (November 15, the first day of the anniversary of the Polytechnic uprising) a group of 50-60 ‘anarchist’ thugs, armed with sledge hammers, iron sticks, brass knuckles, marbles, stones and molotov cocktails attacked members of tens of ‘leftist ‘organizations (Antarsya, Trotskyists, Maoist, as well as anarcho-syndicalists) who stood with their tables outside the Polytechnic at the center of Athens. The attack was completely unprovoked and without the slightest pretext, accompanied by a shower of sexist abuse and threats. Seven members of these leftist groups were taken to the hospital. Women members were hit in the legs and body with brass knuckles. According to an anonymous text issued in Athens Indymedia, the ‘anarchist’ team made a mistake as they thought that they are members of the Greek Communist Youth!!! No anarchist group has condemned this disgusting attack till now. There is a chronic feud between anarchists and the Greek Communist Party (KKE). Recently, members of the Communist Party of Greece evicted an anarchist squat for hosting refugees in Lesvos. 11 Nov 2015: Approximately 20 members of the KKE (Greek Communist Party) wearing helmets and armed with metal bats have raided a former labor hire center in Mytilene that had been occupied by anti-authoritarians and refugees. The center had been operating as a self-managed space for refugees. The space was being entirely run by the refugees and had been a space to provide support for refugees and immigrants as well as organize demonstrations and solidarity actions. The KKE are claiming ‘ownership’ of the building and are alleging that ‘severe damage’ has been caused by the occupation. The KKE are also claiming that refugees are still welcome to stay at the building however all the refugees fled during the violent raid and the building is now being guarded by KKE members. According to several sources the building was in fact originally owned by OAED (Greek Manpower Employment Organization), a labor hire company. The KKE are despised by anarchists and anti-authoritarians in Greece for their Stalinist organizing practices and their collaboration with the previous government. 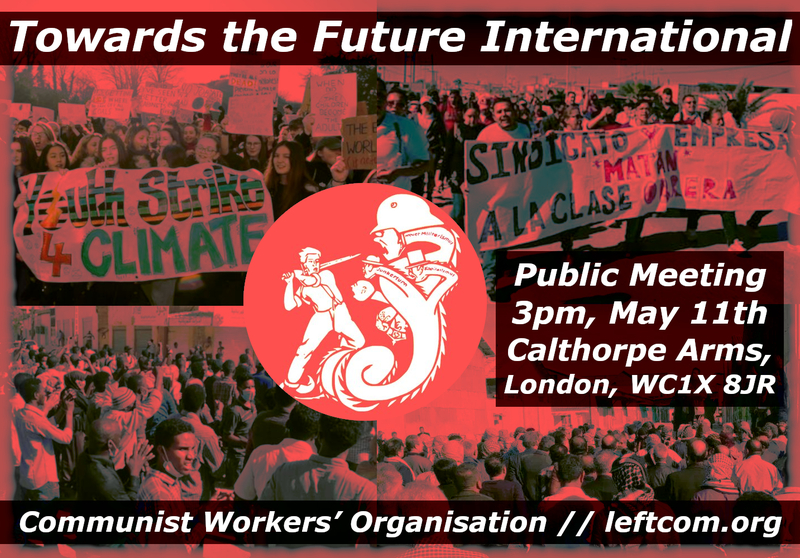 First Steel strike in UK in 30 years? Working class people have seen their living conditions under attack for many years. In Britain, benefits continue to be slashed, people work in increasingly precarious situations and are not being paid enough to cover their food bills. Homeless people are sleeping rough in every town and city, health services are creaking at the seams and schools are not given enough resource to buy basic necessities. Life for many is turning into a living nightmare while the loan sharks and drug pushers leech off the most vulnerable. These hardships are no accident but flow directly from the crisis of the bosses’ system, capitalism. For the boss class any hardship, war or ecological disaster is worthwhile as they desperately try to boost their profits. This grim situation has developed whether Parliament and the Town Halls are filled with Tory or Labour. Hoping that we will be fooled by “old wine in new bottles” Momentum has dragged many desperate people back into the deceit that electing well-meaning representatives can somehow challenge the horrors of capitalism. Organising ourselves to start a fight back has never been more important. If we want to start on the road to a better future then we have to make sure sure that the Labour Party and their hangers on don’t lock us into the bosses’ system. Join us to discuss these ideas and the way forward. Where: The Black-E, 1 Great George St, Liverpool L1 5EW. 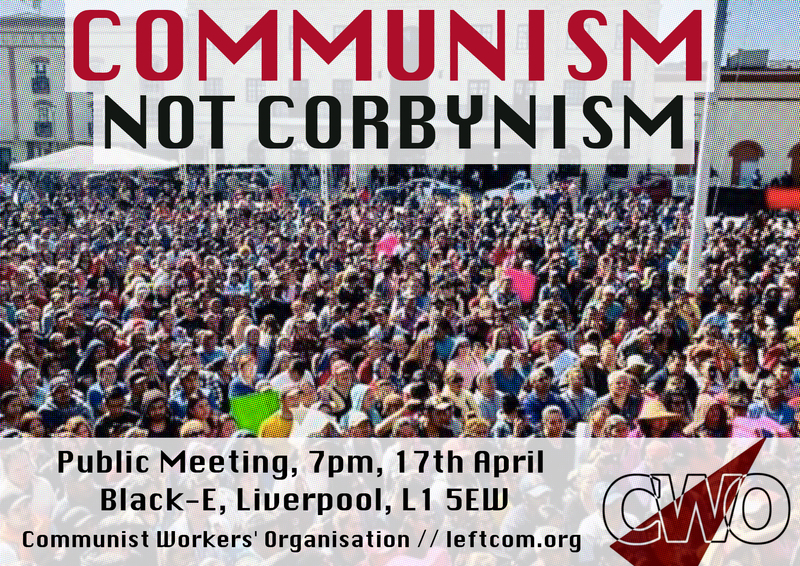 Ask for the 'communist' meeting at the reception.